Naval Dockyard Mumbai in inviting online applications from ITI eligible applicants for filling up the post of Apprentice. Aspirants, who are willing to apply for Naval Dockyard Mumbai Recruitment, can fill online application form before the last date. Applicants are advised to give their most of the time to the preparation of Written Examination because competition is very difficult to crack for upcoming selection rounds. We are telling you again under Naval Dockyard Mumbai Recruitment notification various vacancies should be filled. All these vacancies should be filled by eligible and hard working talented applicants. Aspirants who wish to be a part of Naval Dockyard Mumbai means want to work in government sector. If you want a job in Naval Dockyard Mumbai then do start your preparation in smart way. Applicants having talent are welcome for these openings. 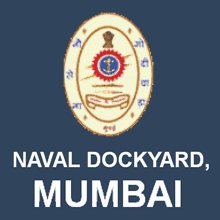 We have placed complete details therefore that you can apply for Naval Dockyard Mumbai Recruitment with ease. Education Qualification ->> Candidates must have passed 10th Std with a minimum of 50% marks in Std 10 examination along with in examination passed (Provisional National Trade Certificate acceptable) in relevant trade with aggregate of 65 % marks. Age Limit ->> Born between 01 April 1999 to 31 Mar 2006 Relaxation (in Upper age limit) : 05 years for SC/ST, 02 years for wards of Defence employees or Naval civilians. Selection Process ->> Selection of the candidates will be done on the basis of their performance in Examination. Application Fee ->> No Fee. How to Apply ->> Interested applicants who are going to apply for Naval Dockyard Mumbai Recruitment they need to download application form through official website of Naval Dockyard Mumbai that is www.bhartiseva.com before last date.